One of my favorite just-wing-it dinners is fish tacos. I LOVE the combination of tangy lime with light, flaky fish and other fresh ingredients. They're ready in under 30 minutes, and they make a perfect meal for enjoying these late summer nights on the patio. I don't mess around with trying to deep fry my fish in glutinous breading (or non-glutinous breading...even more complicated). Too many steps, calories, and grease. Lime juice and garlic salt is all you really need for wonderful flavor. Besides - all these other toppings are like sensory overload anyway, so you won't miss the artery-clogging fish coating. If my flavor-and-texture-obsessed mouth is happy with it, surely yours can be too. The cabbage slaw is my all-time favorite side dish and topping. It's so simple! And loaded with anthocyanins (potent antioxidants that are also anti-inflammatory, anti-tumoral, anti-carcinogenic, antimicrobial...etc) which give cabbage that purple color. This version, like in a previous recipe I posted, is my Fresh Mex edition. Stay tuned for the American, Italian, and Asian adaptations! Since I'm pretty wary about most corn, knowing that there's little to no corn in the US that isn't GMO and saturated with dangerous pesticides, I like this brand. They're the makers of "Ezekiel Bread," and I find them at Sprouts and Natural Grocers. Soaking and sprouting grains and nuts helps activate their nutrients, and helps remove "anti-nutrients" like phytic acid that inhibit the absorption of nutrients in our bodies. This makes grains and nuts more digestible and less inflammation-producing. So if I'm going to eat corn, I feel much better when it's organic and sprouted! All you'll need besides tortillas and oil for cooking. How easy is that! Experiment and have fun with your food! The more variety the better! Make the cabbage slaw and set aside. Season the fish. In a bowl, squeeze juice of 1/2 a lime over the pieces of fish and add 1/2 tsp garlic salt. Cook the fish. Heat oil over medium-low heat in a nonstick skillet. Add fish to skillet, flipping the pieces halfway through. It will be opaque all the way through and flaky when done, about 5-6 minutes depending on the thickness. Remove the fish from the pan and cover with foil or a lid. Season quinoa. Add juice of 1 lime and remaining 1 tsp of garlic salt to the quinoa. Serve. 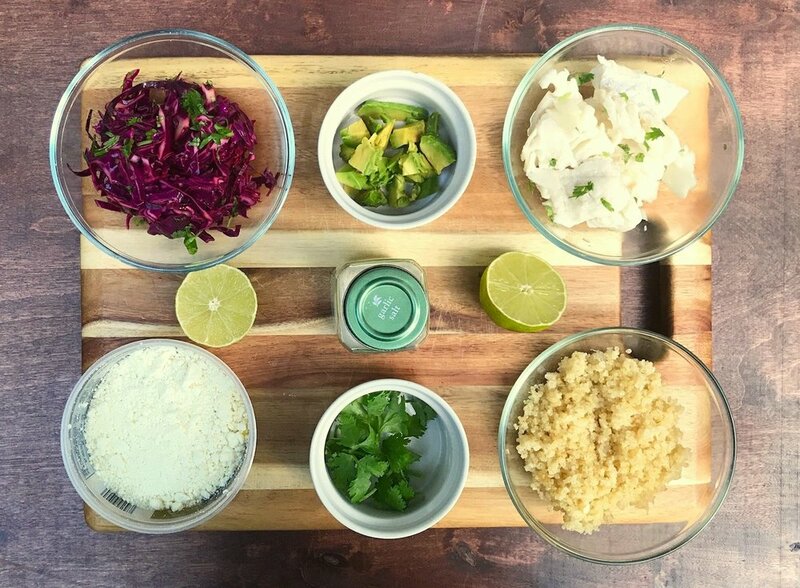 Top tortillas with quinoa, slaw, fish, avocado, cheese, cilantro and a lime wedge. Serve with chips and salsa (or your dietary needs equivalent) and a sparkling festive drink.